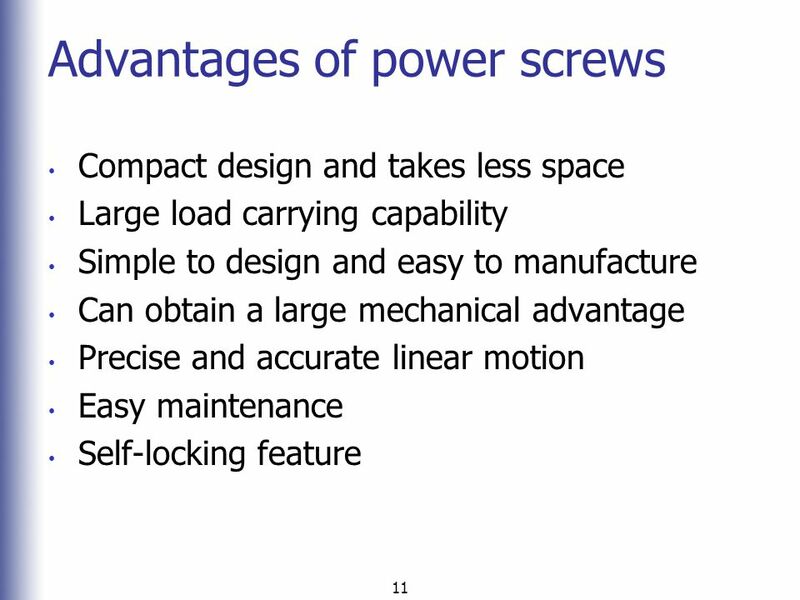 4 Uses of Power Screws Obtain high mechanical advantage in order to move large loads with a minimum effort. 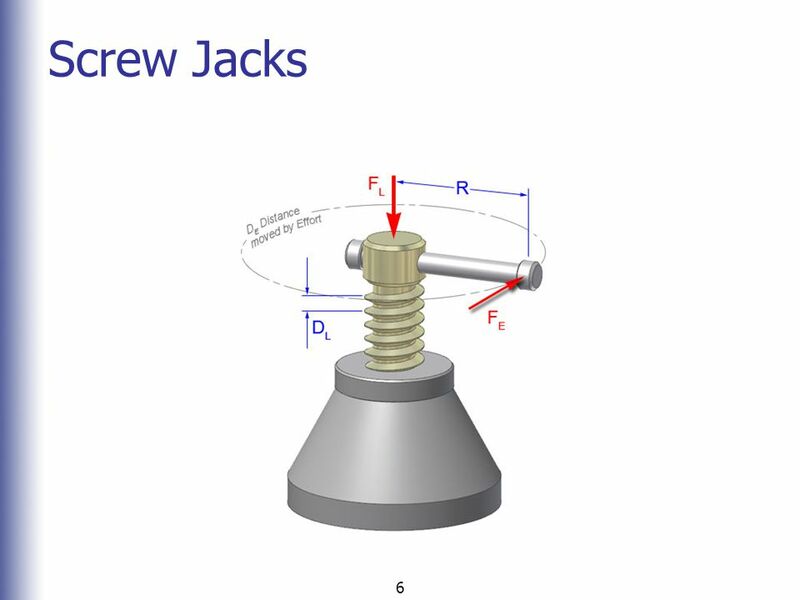 e.g screw jack. 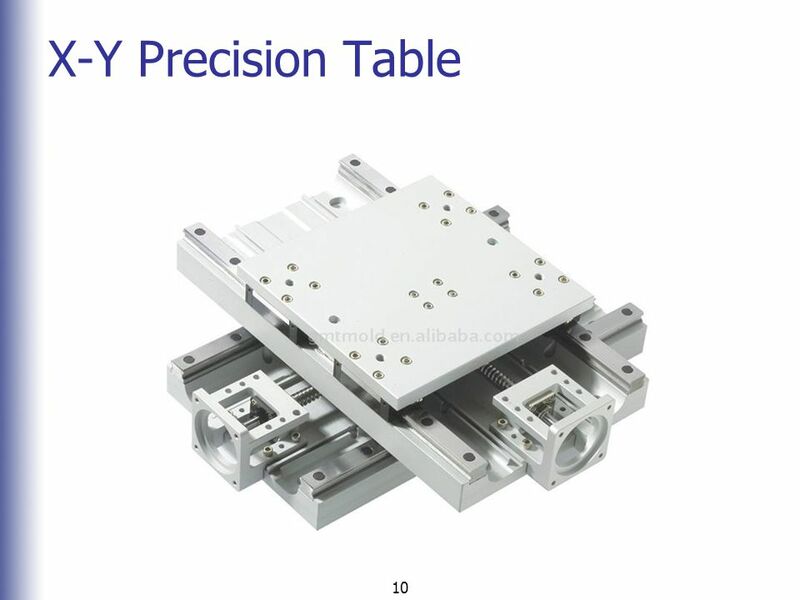 Generate large forces e.g tensile testing machine, compactor press. 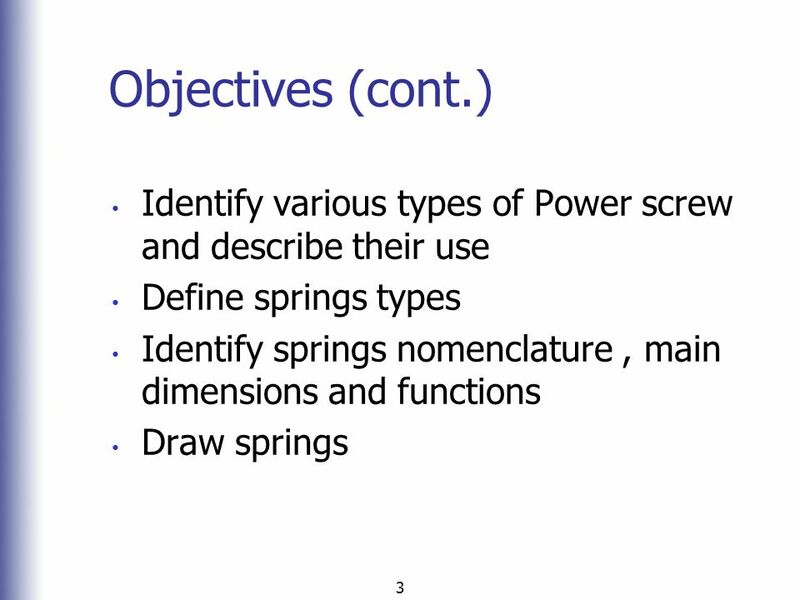 Obtain precise axial movements e.g. 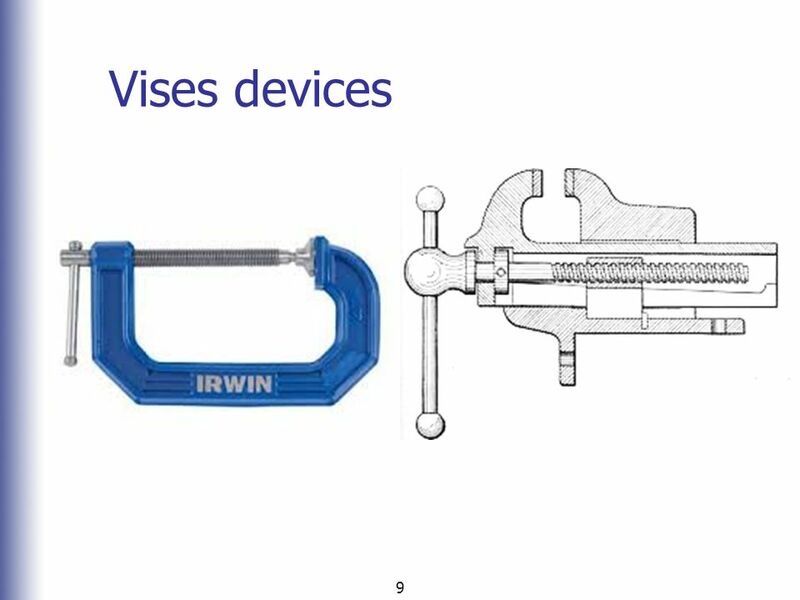 camera calibration rigs. 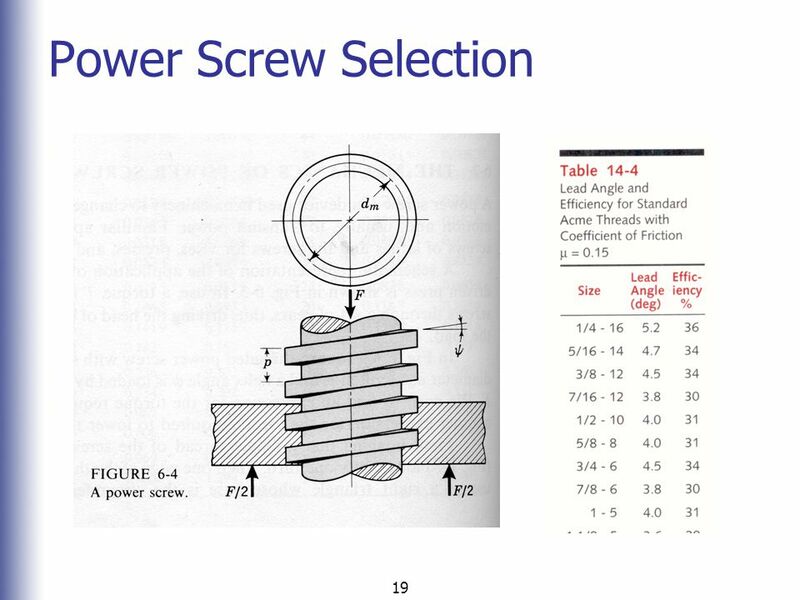 5 A power screw is a device that is common to tools or machinery that are used to change angular motion into translation. 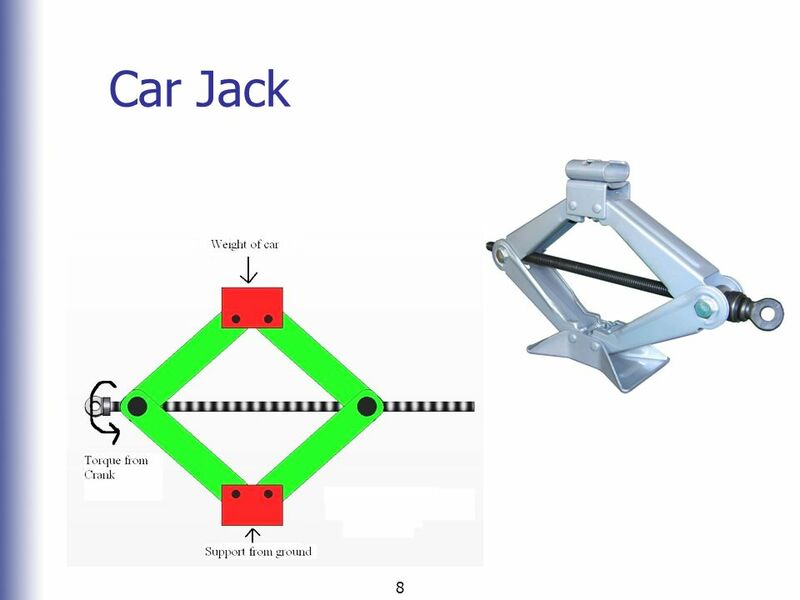 It is also capable of developing a large amount of mechanical advantage. 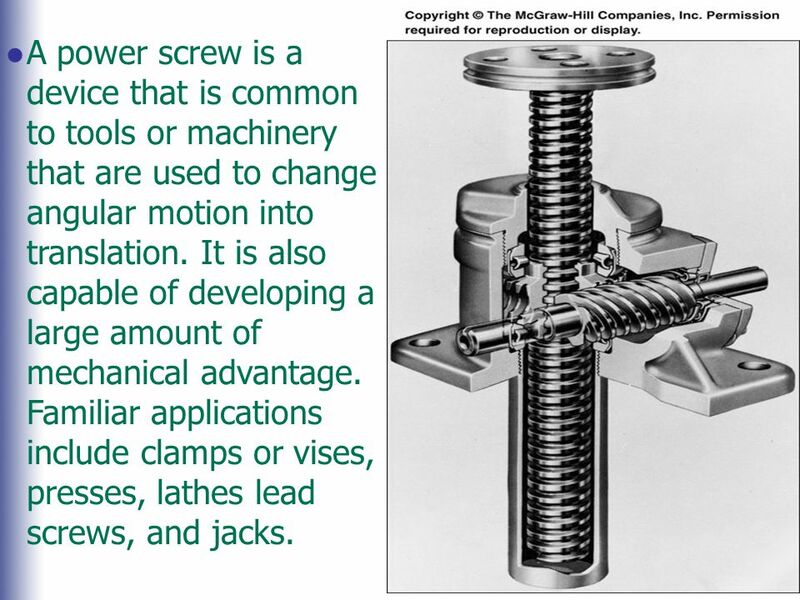 Familiar applications include clamps or vises, presses, lathes lead screws, and jacks. 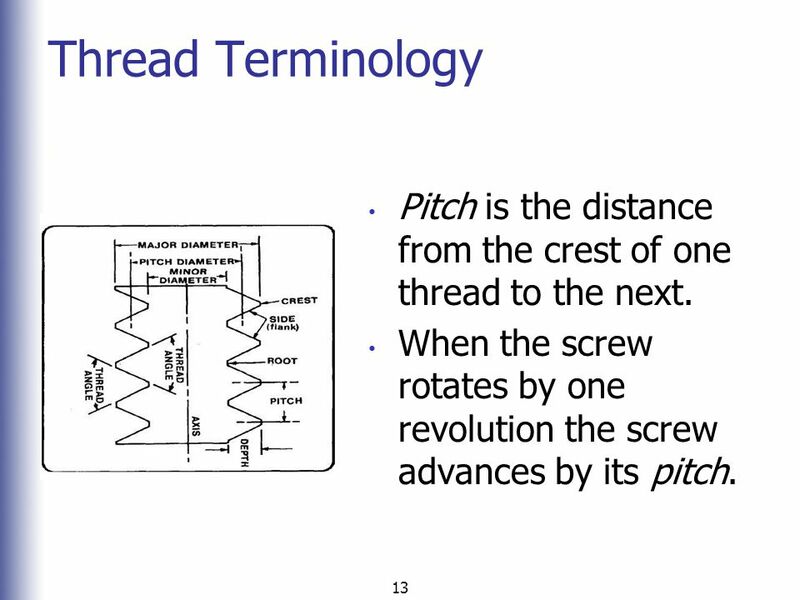 13 Thread Terminology Pitch is the distance from the crest of one thread to the next. 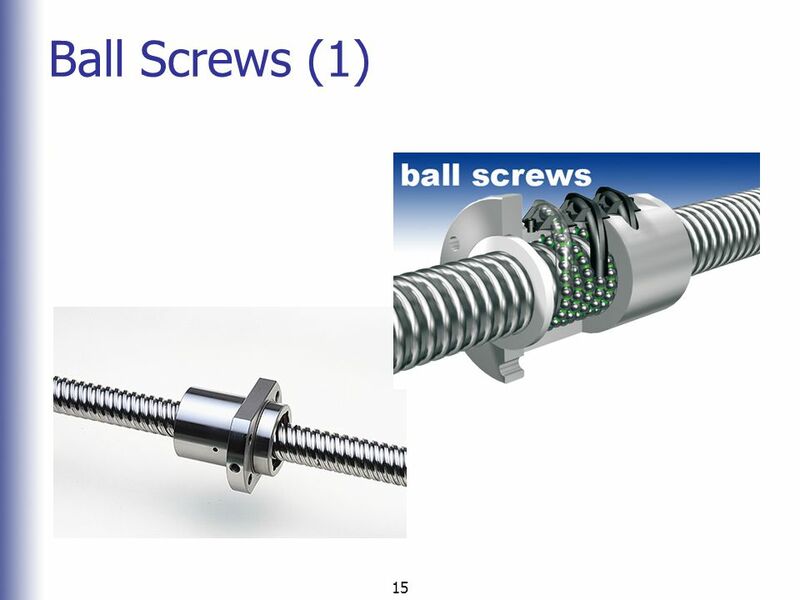 When the screw rotates by one revolution the screw advances by its pitch. 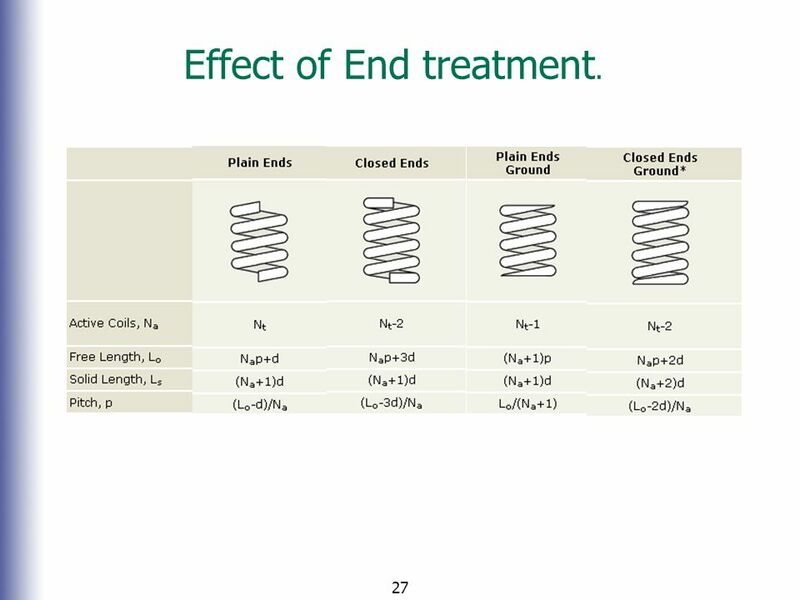 27 Effect of End treatment. 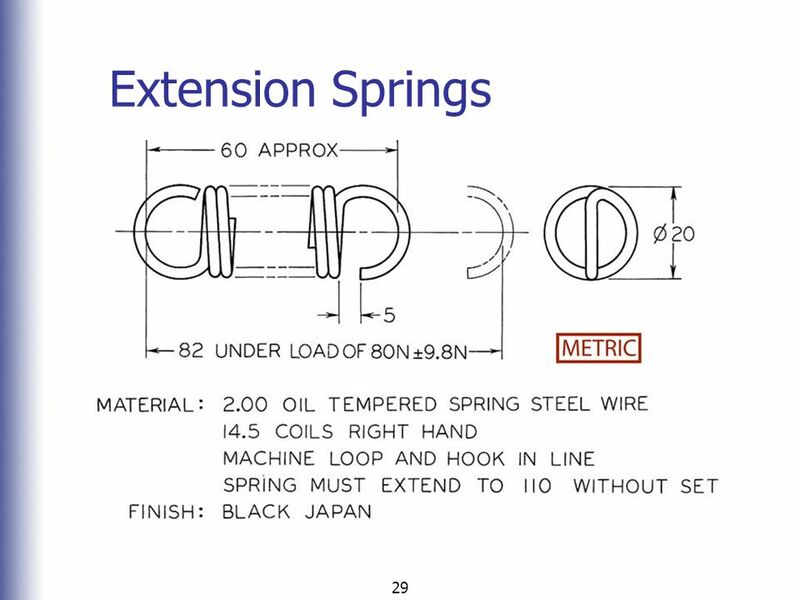 32 Self-dampening The reason for using multiple leaves clamped together rather than a single piece of metal cut to the same shape has to do with what happens when a load is applied to the spring. 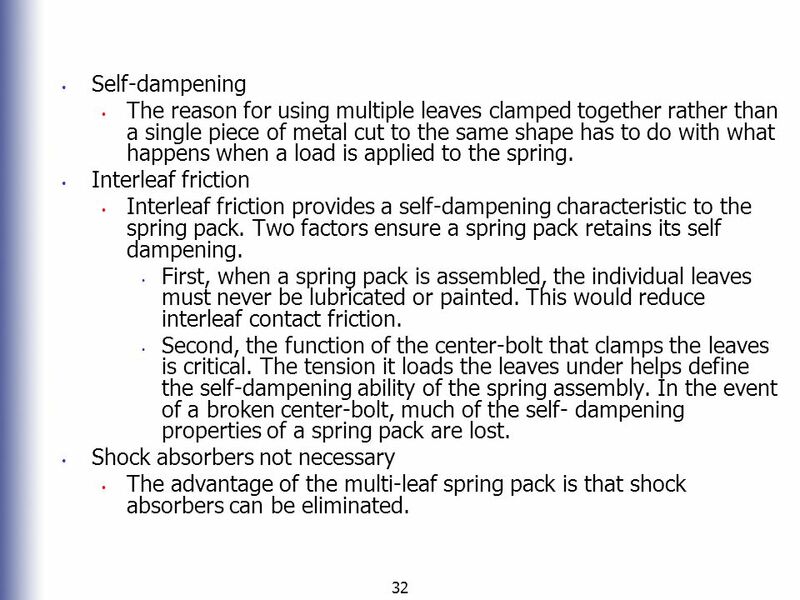 Interleaf friction Interleaf friction provides a self-dampening characteristic to the spring pack. 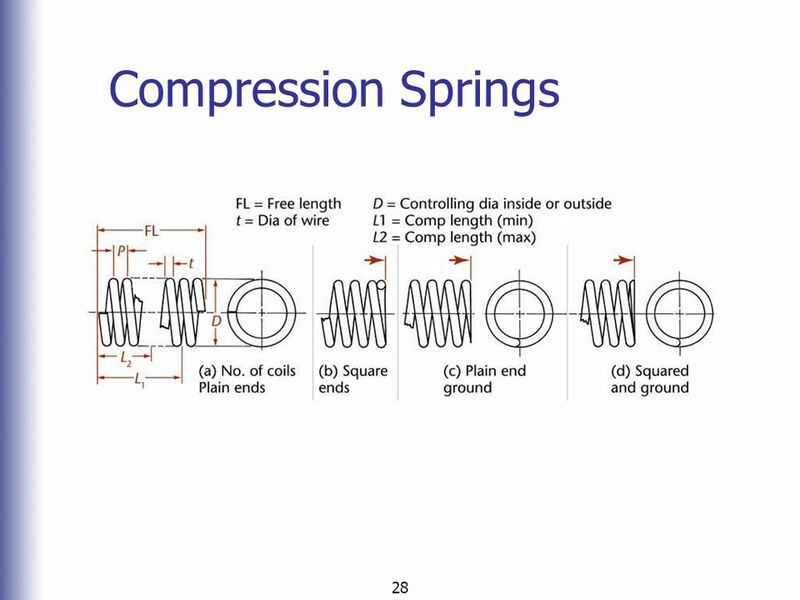 Two factors ensure a spring pack retains its self dampening. 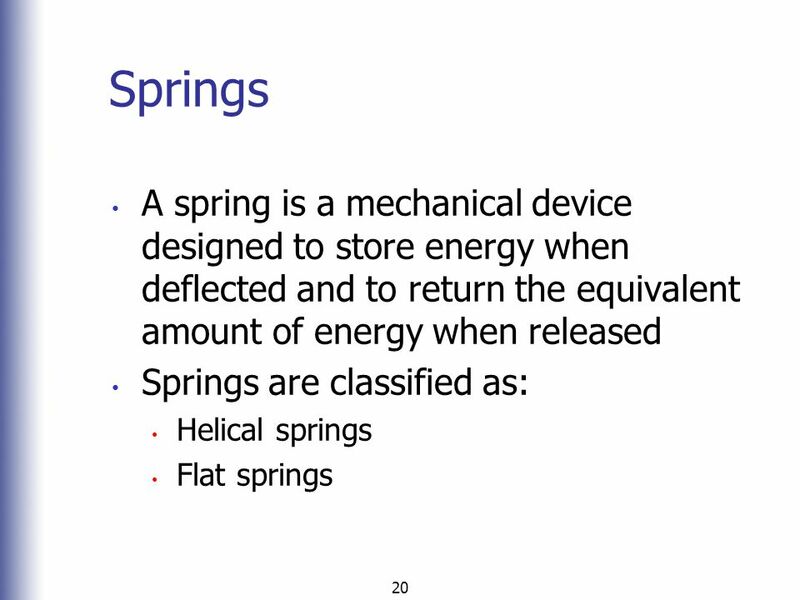 First, when a spring pack is assembled, the individual leaves must never be lubricated or painted. 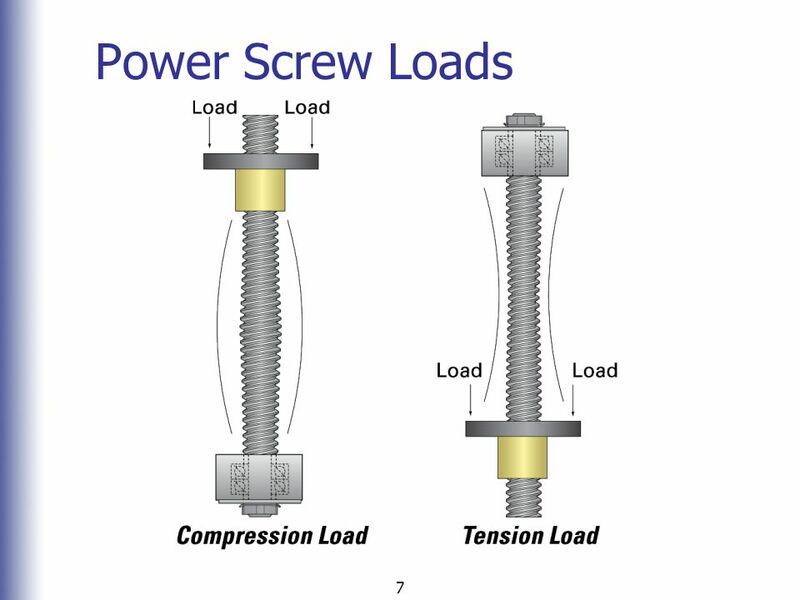 This would reduce interleaf contact friction. 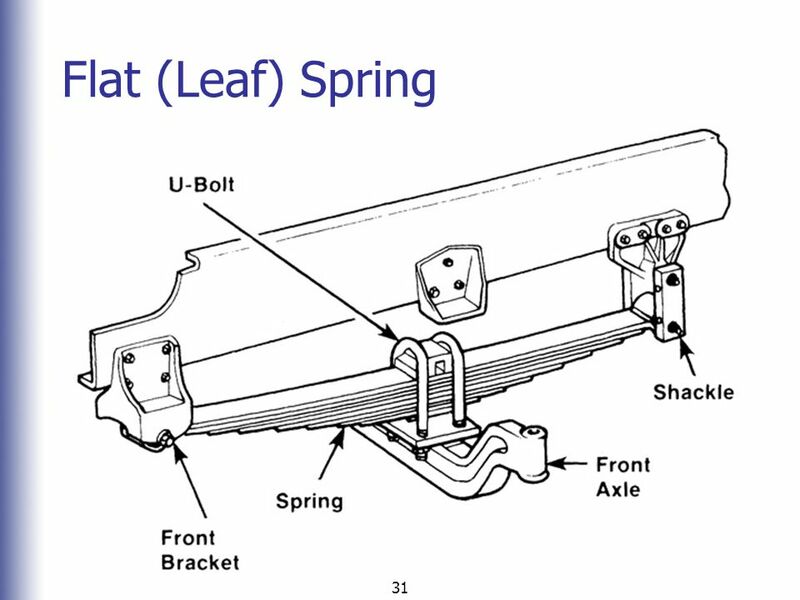 Second, the function of the center-bolt that clamps the leaves is critical. 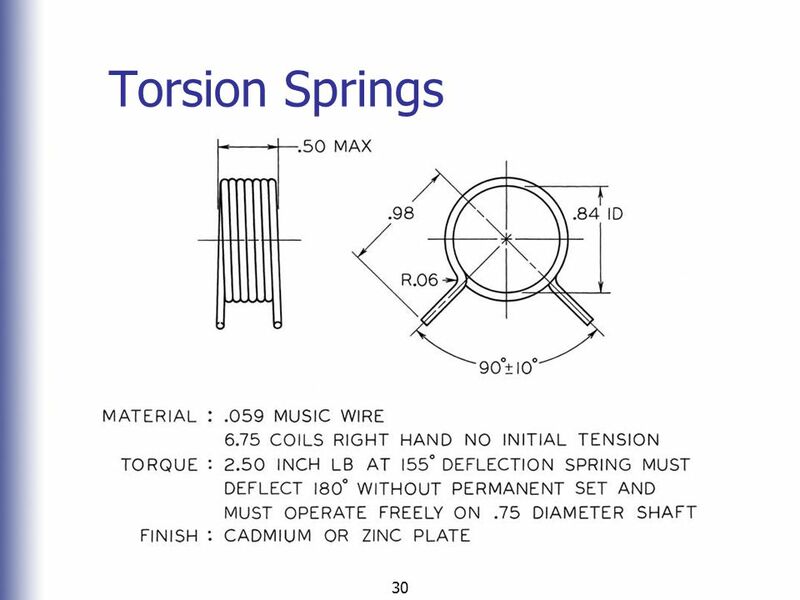 The tension it loads the leaves under helps define the self-dampening ability of the spring assembly. 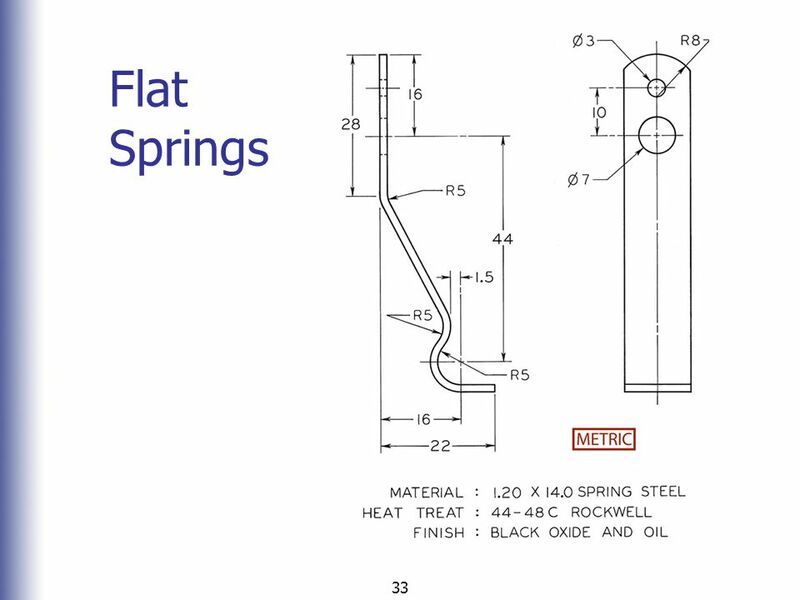 In the event of a broken center-bolt, much of the self- dampening properties of a spring pack are lost. 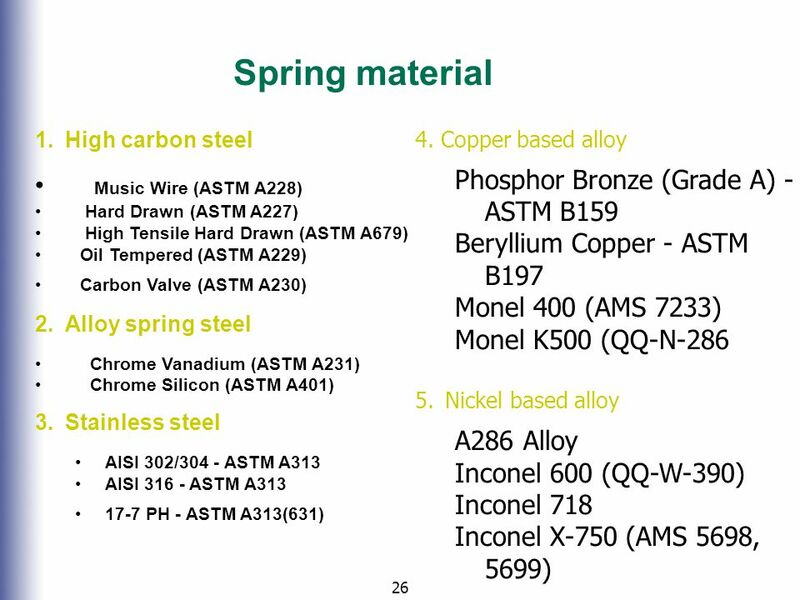 Shock absorbers not necessary The advantage of the multi-leaf spring pack is that shock absorbers can be eliminated. 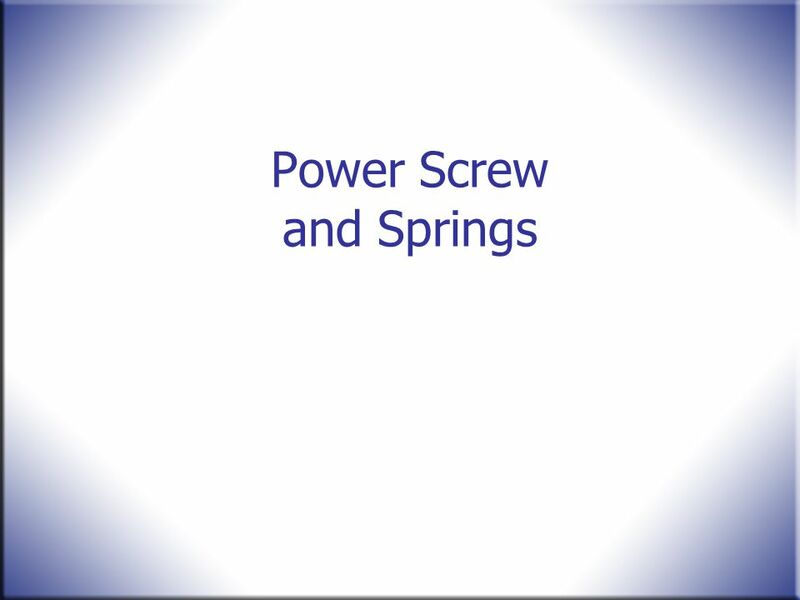 Download ppt "Power Screw and Springs"
METALS Learning Objectives: What is METAL? 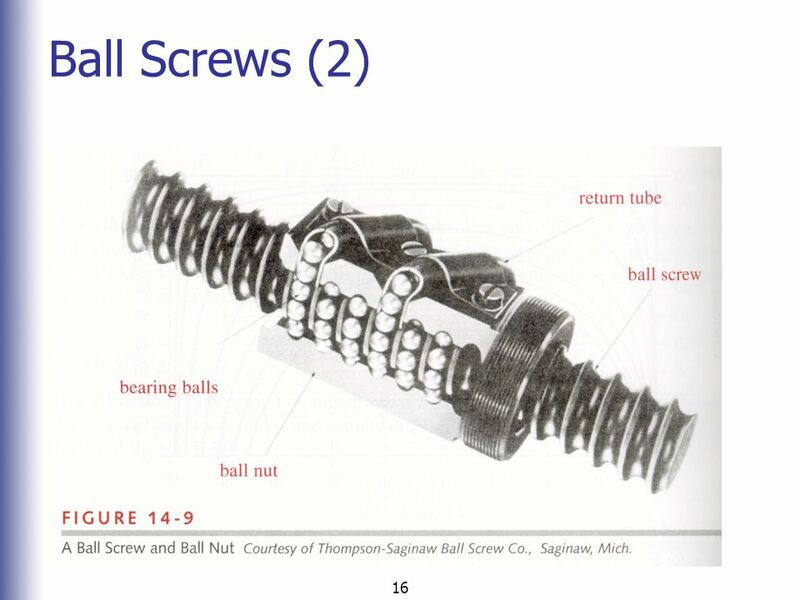 Chapter 17: Springs It must be confessed that the inventors of the mechanical arts have been much more useful to men than the inventors of syllogisms. 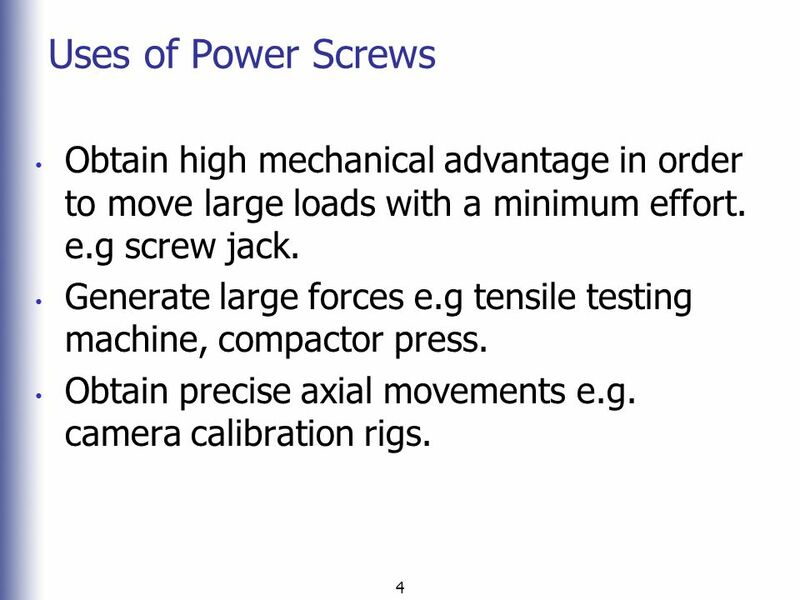 Chapter Outline Shigley’s Mechanical Engineering Design. Bearings Nizwa College of Technology. 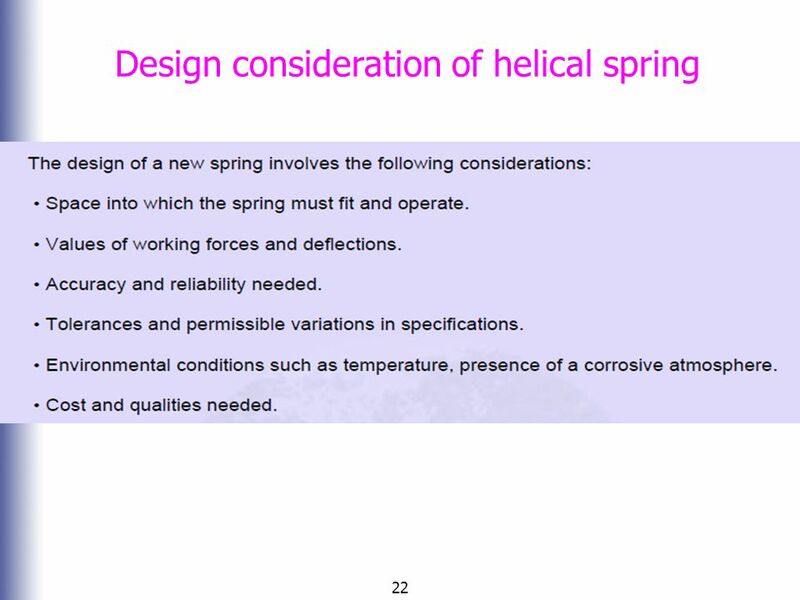 WHAT IS SPRING? 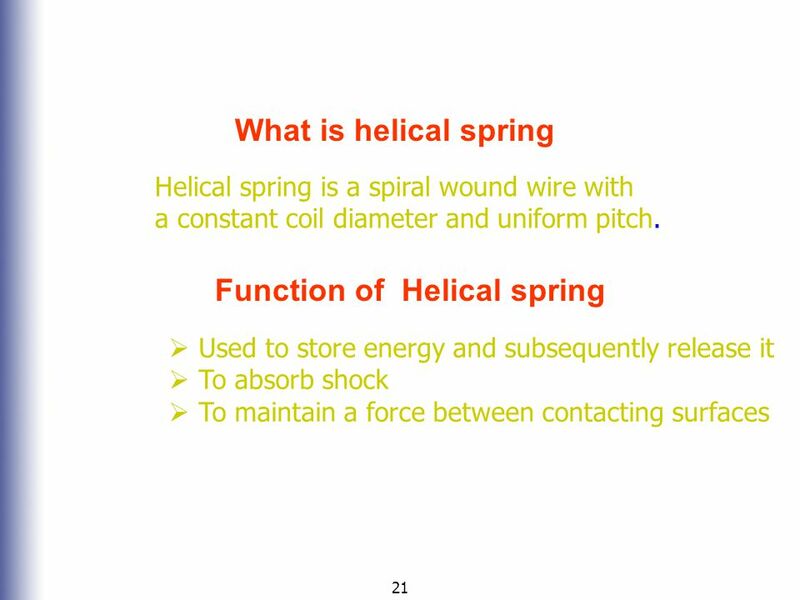 Springs are elastic bodies (generally metal) that can be twisted, pulled, or stretched by some force. They can return to their original. 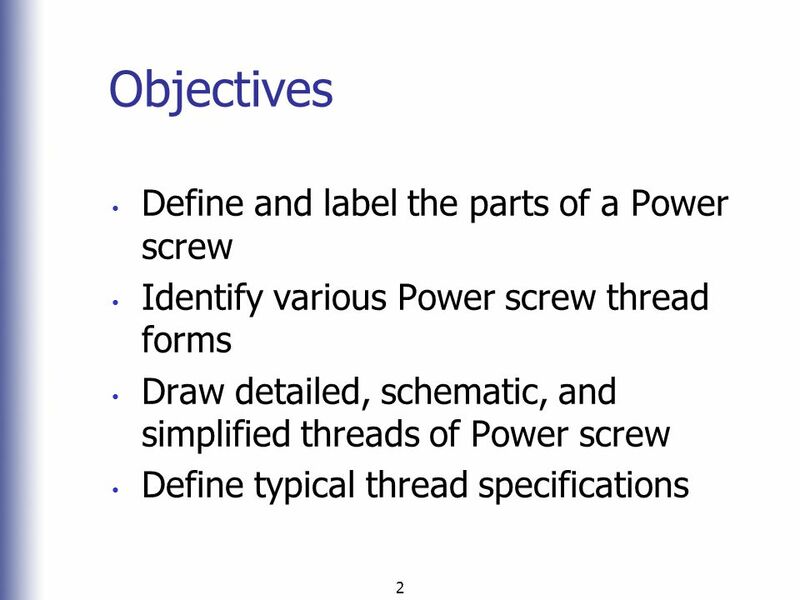 ME1001-BASIC MECHANICAL ENGINEERING. 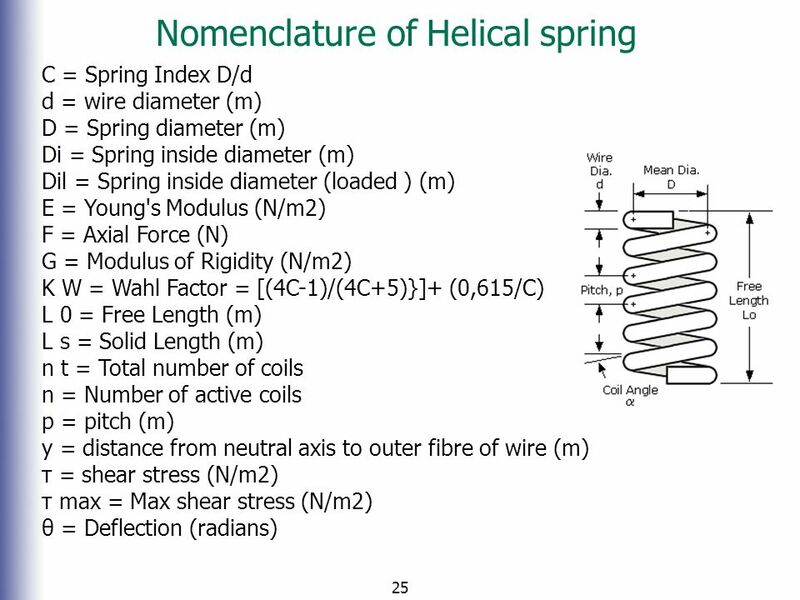 SYLLABUS UNIT I– MACHINE ELEMENTS– I(5 hours) Springs: Helical and leaf springs – Springs in series and parallel. 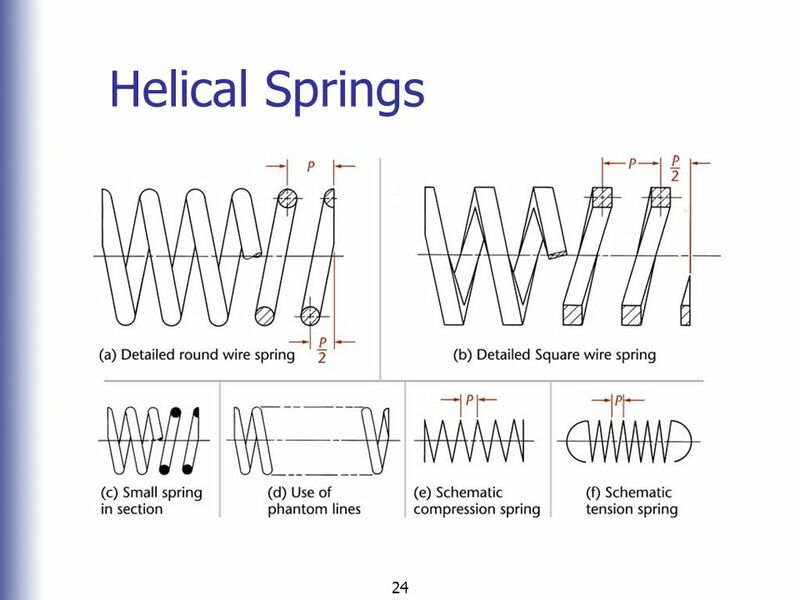 The George W. Woodruff School of Mechanical Engineering ME ME 3180: Machine Design Helical Torsion Springs Lecture Notes. 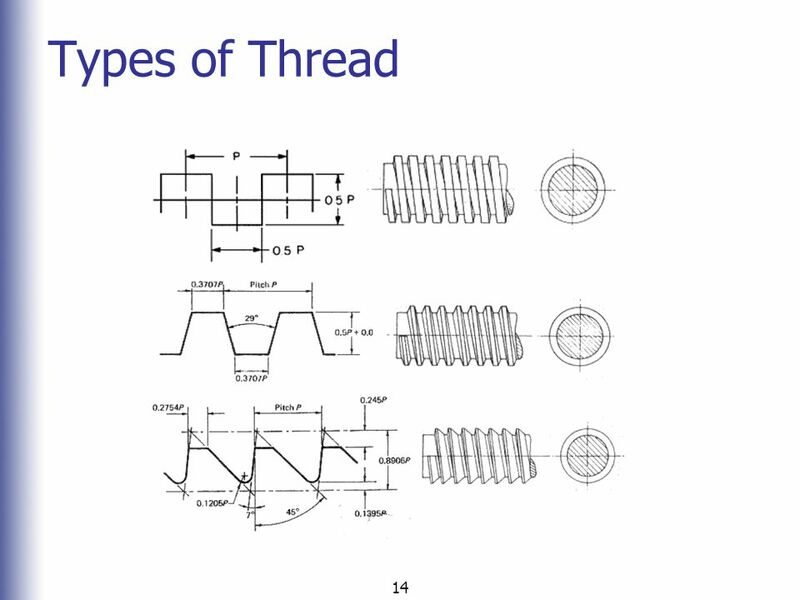 The George W. Woodruff School of Mechanical Engineering ME3180 ME 3180: Machine Design Mechanical Springs Lecture Notes 1.